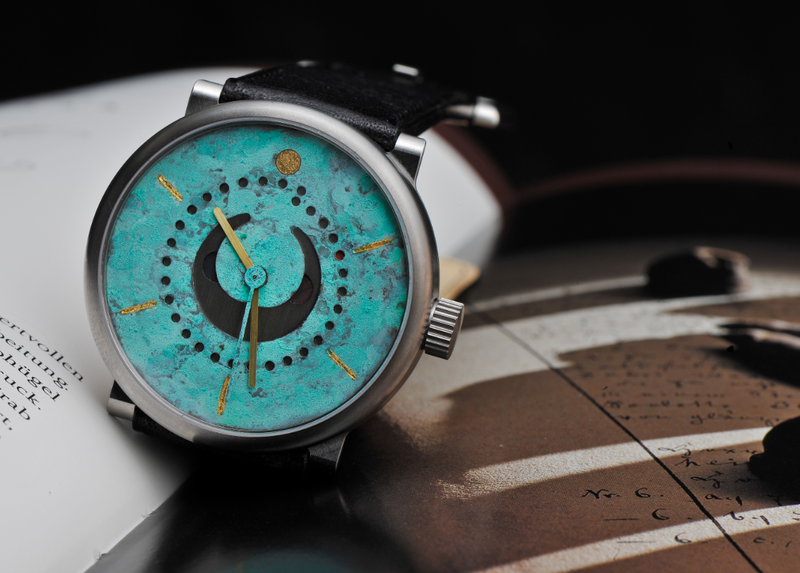 ochs und junior fulfills horological dreams! They are great for special anniversaries. As so often happens when discussing a new watch project here at our Lucerne oxloft, we can bring so many possibilities to bear, including stunning ideas and solutions. The Nebra sky disk is a bronze disk inlaid with gold symbols. It is thought to be the oldest depiction of the night sky yet discovered. This archaeological find is the inspiration for the selene nebra. In the centre of this highly accurate moon phase watch is the titanium disk bearing an inlaid garnet representing the full moon, and a circular sliver of onyx symbolising the new moon. 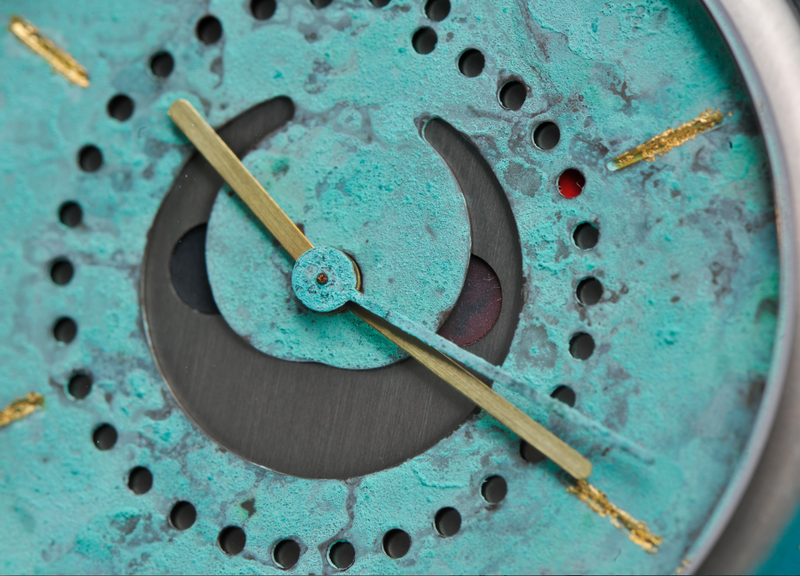 The indices are picked out in gold leaf against the copper-patinated dial. 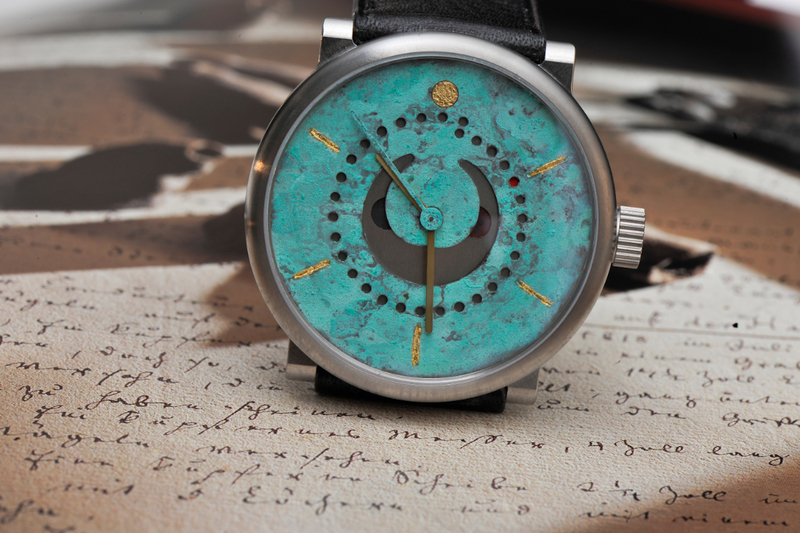 The seconds hand has also been patinated to allow the matt brass hour and minute hands to stand out. We went to the bank for the sun symbol at 12 o’clock and bought one gram of pure gold: this was melted, hammered and inlaid into the milled indentation. Because the owner of this exclusive timepiece cycles to work on his titanium bicycle, the case just had to be fashioned from the same material. Here it is with the new crown.